A Curator as they appear in-game. Curators are minor non-player character that appear at information centers in Mario is Missing!. A Curator appears in every city of the game. 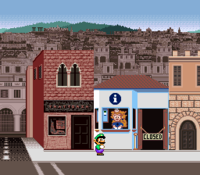 Like other people Luigi speak to throughout the game, Curators provide Luigi with information about the area where the plumber is, or information about the artifact Luigi is holding. The Curators' appearance is almost identical to Princess Peach's sprite in Super Mario World. The only difference being the change of hair and dress colors. Notable is the fact the recolor mimics that of Princess Daisy's only current in-game colored sprite from NES Open Tournament Golf. In the NES version, however, they instead have black bob haircuts. This page was last edited on January 23, 2018, at 18:43.